It is strongly advisable to take enough rest when need be. This is the main reason why many of our hotels in town seize this opportunity to come up with an idea of creating a perfect environment with attractive things for us to use when relaxing in their hotels. Many people want to set their backyard as a beautiful park. They present to us a relaxation center with the majority of them adopting the motto ‘home away from home’. So, invariably, we are paying for relaxation by continually patronizing them. Honestly, I give a massive kudos to the entire hotel and relaxation center for coming up with this life-saving idea. I like the concept, and it is a welcoming idea. But let us come to think of it, as long as you and your family members live, you will be in need of relaxation per time. In order for you to save your money, why can’t you make your backyard home into a relaxation center? You can do some DIY work and therefore turn it to a good looking paradise that is well conducive for relaxation. 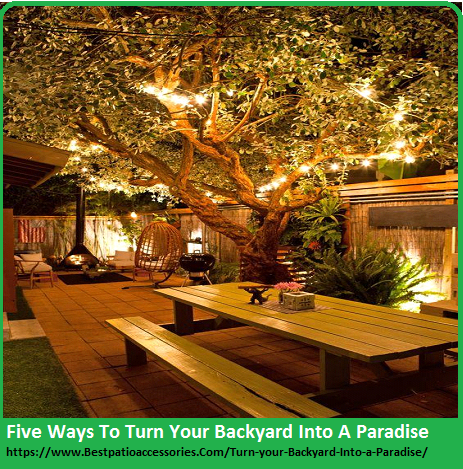 So, We Will Be Looking At The Five Ways To Turn Your Backyard into a Paradise. It is globally accepted that good planning precedes good achievement and result. This is very important for those aspiring to build a house; you need to have it in your plan that you will have a spacious backyard for relaxation. For those that already have their houses, you can as well turn that your garden to a beautiful paradise regardless of its size. When planning for a backyard that will serve the purpose of relaxation, some factors need to be put into consideration; the first one is the topography of the place, the topography or the shape of the land determines a lot. If the topography of the place suite your taste, you can go with it. But if not, you can amend it by using the machine to level it for you. Also, you can go for space with the natural water body. The nature of the land is also essential, what I mean is the type of soil present in the ground. Is it the soil that will support good germination and sustenance of plants that you will be planting there? The environmental and climatic condition of the place is also essential, e.g., rainfall, the rate of sunlight, and humidity, the edaphic factor should also not be overlooked. Another factor is the size of the actual place you want to use as a backyard. Please note that it should not be too big all small for proper management and satisfied relaxation. The nature of the building you erect on your land is also a determining factor, the space and height of your building need to be put into consideration when planning how your backyard will look like. The last but not least, is the financial aspect, note that, having a backyard like a paradise does not necessarily mean that, it is an investment that will drain your money. You shall choose natural things for your backyard and use your money prudently. Plant the color you want the backyard to have. The plants that you will be planting should not be planted by accident, they should have a specific, for instance, Cultivate the plants that please you, I mean to plant the features you love seeing even your children’s choice should be brought to the backyard and be adequately maintained so that your family will never be tired of the backyard. Your children should have a demarcated place where they will be relaxing, and things that are very attractive to them including plants should be introduced in their section. Objects of the color that are appealing to the sight of your family should not be left out, and there should be a good color combination. For instance, Green and blue are perfect for the beautiful backyard. Climate change should be considered, plant what will save you from the sun when relaxing and plants that will enhance proper ventilation in the backyard. Also, you can have areas open to sunlight for winter days. You can as well have a fire pit which is good for both winter and summer. Consider plants that you can easily maintain, for instance, moss tree will provide you right shade where you can read and listen to music. Also, you can lie down on carpet grass for your muscles to be well relaxed. Sincerely, you don’t need any stress to maintain these plants. Also, a backyard that will look like paradise should be free from insects that may pose a threat to your health. So you can have some plants that repel or control mosquitoes and bugs. You can plant lemongrass for this purpose. Also, you need ground cover plants like sedum and carpet grass that can control erosion and drought. All three can have a light on them for night hang out, and this makes your backyard looks very beautiful at night. Lawns are essential for the beautification of your background. You can use pleasant flowers of the colors you like to make lawns and make sure that your color combination is excellent. Pruning of these lawns is essential, and you can prune them to the shape you want or write the name you like. Also, weeding is important, and you can as well put a light around the shape of your lawns for night purpose. Make sure there is a space in between your lawns, where you or your children can play and have maximum enjoyment. If you have natural elements like water bodies, and pleasant trees in the backyard, make sure they are well preserved, and you manage them appropriately for your enjoyment. Animals that add to the beauty of nature should be introduced to the backyard to add to the pleasure. Animals like birds with sonorous sounds and butterflies are magnificent in this regard, but never bring in harmful animals like snakes into the backyard for the safety of you and your family. In case you don’t have a natural water body, you can create an artificial water body that will add to the beauty of your paradise backyard. It also enhances the coolness of your backyard. At the same time, you can get water from it for irrigation of your plants and lawns. Rocks in your backyards are also useful, you can paint them with your desired color that will not emit much heat to beautify your backyard the more, and you and your family will see it as one of the better places to gist and make fun. All these natural gifts enhance the inspiration of men. Furniture that is very suitable and durable are needed in the backyard, and you can put them in an open place and give them an artificial shade that will make them last longer. Chairs, sofas, tables, bar sets are an example of furniture that is needed. Also, the playing materials for your children should be put in their section, but let them be designed in such a way that injury will be avoided. Houses for some of your pets are as well needed in the backyard, and you will make sure that they are well cleaned every time to avoid an outbreak of pathogens and diseases. Also to avoid unpleasant odors, Swimming pool should be readily available with a well acceptable depth. Swimming relaxes the body very well. Having a backyard like a paradise is possible without costing you a lot, all you need is to follow the above tips. And you will be surprised that your maximum satisfaction can be gotten in your home.